Bruce Brown Jr. has had big games against AP Top 25 opponents before. Dewan Huell has made scoring look easy all season. But Sunday night belonged to freshman guard Chris Lykes. Lykes scored a career-high 18 points in 25 minutes off the bench to provide the spark the No. 15 Miami Hurricanes needed to defeat the No. 24 Florida State Seminoles 80-74 Jan. 7 at the Watsco Center. The Canes (13-2, 2-1 ACC) got back on track after losing two of their last four games. The Noles (12-3, 1-2 ACC) have lost two of their last three matches, albeit all of them were against ranked opponents. Brown led UM with a game-high 23 points and made 12 of his 14 free throws, adding to his list of great performances against some of the country’s best teams. Huell came up just shy of a double-double with 20 points and eight rebounds. He has scored in double-digits in six of his last seven games. Lykes, a speedy point guard standing at just 5 feet 7, grabbed all the fans’ attention with a variety of dazzling finishes at the basket and passes to the open man. Lykes, a native of Mitchellville, Maryland, finished making six of his 10 shots, including a pair of three-pointers. 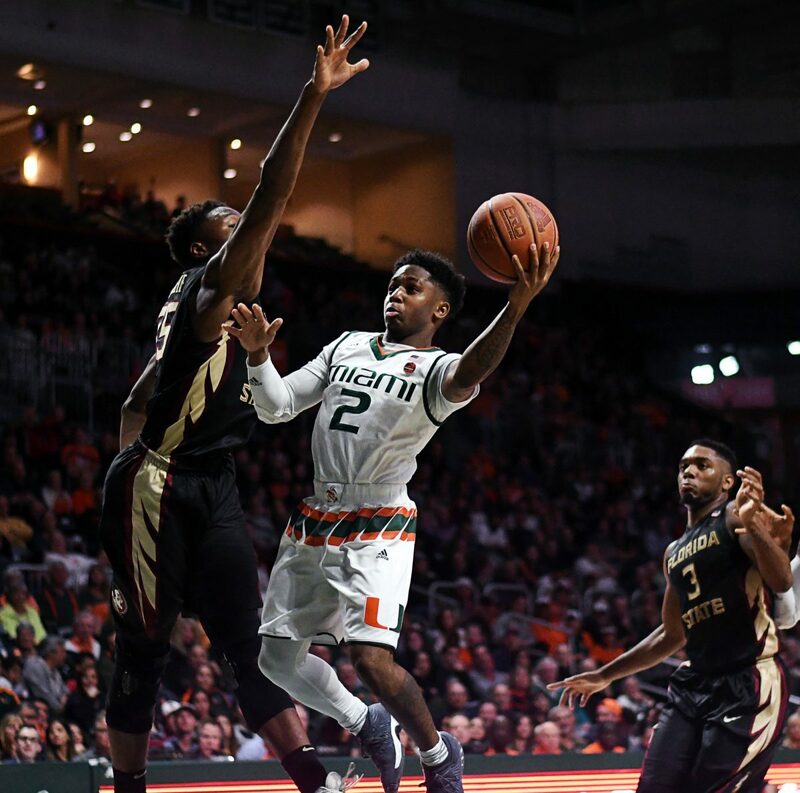 Brown notched his second 20-point performance in his last four games, something Miami coach Jim Larrañaga welcomes after seeing signs of passivity from the sophomore early in the season. Florida State had four double-digit scorers, led by guard Braian Angola’s 16 points, but shot a season-low 36 percent from the field. The Seminoles had 21 offensive rebounds and managed 18 more shot attempts, but it just wasn’t enough. FSU was unable to muster the same type of offensive performance it had to defeat No. 12 North Carolina 81-80 in its previous game. Miami came out of the gates strong, knocking down 13 of its first 14 shots. Lykes capped off the first half with an acrobatic shot in the closing seconds to send the Hurricanes into the halftime break with a 45-32 lead. FSU rallied back, cutting a 16-point second-half deficit to just four with 24 seconds left. But free throws by Brown in the closing moments put the game out of reach. Hamilton, a head coach of 30 years and a former coach at UM, was impressed with Lykes. Lykes left the game briefly with an injury but returned soon after. 17 NBA scouts were in attendance. Miami will look to continue its offensive efficiency against Clemson in a matchup set for a 3 p.m. start Jan. 13 in Clemson, South Carolina.